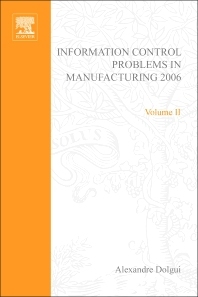 Information Control Problems in Manufacturing 2006 contains the Proceedings of the 12th IFAC Symposium on Information Control Problems in Manufacturing (INCOM'2006). This symposium took place in Saint Etienne, France, on May 17-19 2006. INCOM is a tri-annual event of symposia series organized by IFAC and it is promoted by the IFAC Technical Committee on Manufacturing Plant Control. The purpose of the symposium INCOM'2006 was to offer a forum to present the state-of-the-art in international research and development work, with special emphasis on the applications of optimisation methods, automation and IT technologies in the control of manufacturing plants and the entire supply chain within the enterprise. The symposium stressed the scientific challenges and issues, covering the whole product and processes life cycle, from the design through the manufacturing and maintenance, to the distribution and service. INCOM'2006 Technical Program also included a special event on Innovative Engineering Techniques in Healthcare Delivery. The application of engineering and IT methods in medicine is a rapidly growing field with many opportunities for innovation.